Material imitating grass and/or other vegetation. Ideal for use as basing material and decoration for terrain elements. For use in any miniatures games and dioramas. Tuft height: 6mm. Placed on the sheet size of 20cm x 6cm. 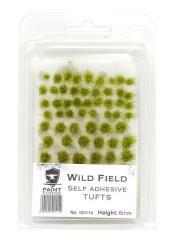 Set contains approximately 120 tufts (including approx. 30 small tufts and approx. 90 medium tufts).